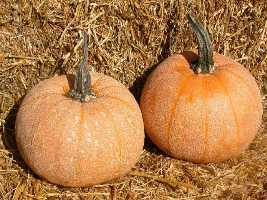 What is the difference between pumpkins, squashes and gourds? Pumpkins, squash and gourds are members of the enormously diverse Cucurbitaceae family, which contains more than 100 genera and over 700 species. They have been providing mankind with food and utilitarian objects since before recorded history. Various members of the genus Cucurbita are known as squash or gourds. Botanists use distinctive characteristics of leaves, seeds and fruit stalks to classify the different species. The origins of these species are lost in time, but all are assumed to have originated in the Western Hemisphere, principally South and Central America and Mexico. Variety selection for the many distinct shapes, sizes and colors has occurred in all cultures worldwide. 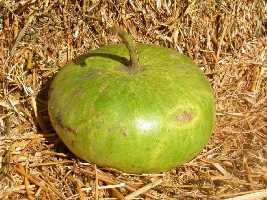 Cucurbita argyrosperma (syn. C. mixta), which includes the cushaw pumpkins and winter squash. Cultivar pictured ‘Hopi’. 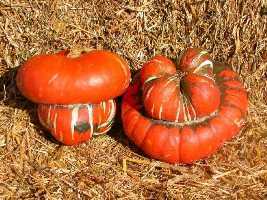 Cucurbita maxima, which includes most of the large, round decorative pumpkins, the turban gourds, the large hubbards, as well as banana and buttercup squash. Cultivar pictured ‘Golden Hubbard’. Cucurbita moschata, which includes the large cheese and crookneck pumpkins as well as the butternut squash. Cultivar pictured ‘Long Island Cheese’. 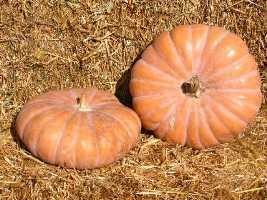 Cucurbita pepo, which includes the field, pie, naked-seed and miniature pumpkins, as well as acorn squash and ornamental gourds. Cultivar pictured ‘Winter Luxury Pie’. 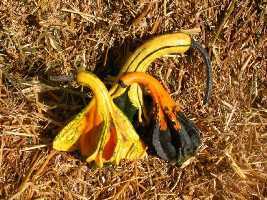 The colorful turban gourd, which we have already learned is actually a variety of Cucurbita maxima. Cultivar pictured ‘Turk’s Turban’. The small, highly colorful ornamental gourds, which are all distinct varieties of Cucurbita pepo. Cultivar pictured ‘Autumn Wings’. 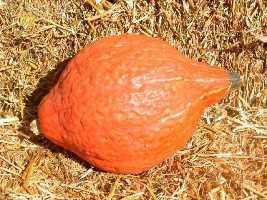 Hardshell, Bottle or Dipper gourds which are not Cucurbita, but family relatives in the species Lagenaria siceraria, which is assumed to be native to Africa, but spread to tropical Asia and the Americas in prehistoric times. 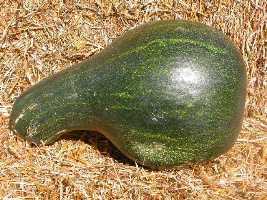 Cultivar pictured ‘Canteen Gourd’. Like the squash, cultivar selections in various shapes and sizes have continued from prehistoric times to the modern era.